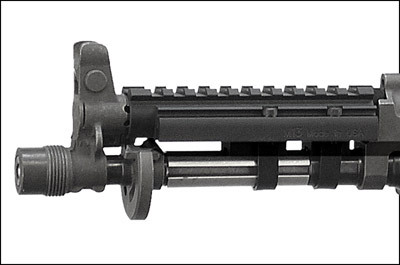 Replaces the piston tube/upper handguard assembly. One-piece aluminum optic mount clamps rock-solid to the barrel. This is the lightest, lowest, and simply the best mount available for AKs. Based on the proven and successful M1-B and M2-B UltiMAK AK mounts, adapted to the shorty "Krinks". Fits most other "Krinkov" style AKs having the same gas system length. Easy installation instructions included. Construction; One-piece aluminum mount body (6061-T6). Hard anodized. 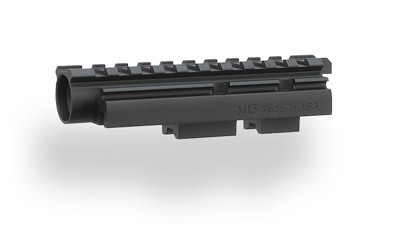 OverAll Length - 4.625" (4 & 5/8"). Barrel clamps are 4140 steel, secured with alloy steel cap screws. At right you see the M13 mounted on an AKS-74U having a stepped barrel in the area of the M13 barrel clamps. Our shim set, SH-1 (shown) eliminates the step so the M13 can be installed tight and level. 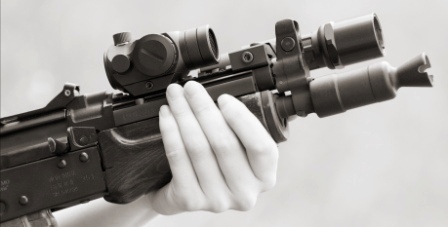 Check your barrel and see if it matches the stepped profile of this one before ordering. If it does, then order the SH-1 and install the shims as shown while also following the M13 instructions, and you're good to go.